Paperback $49.95; e-books also available. As regular readers will be aware, I like spiders as well as butterflies and birds. 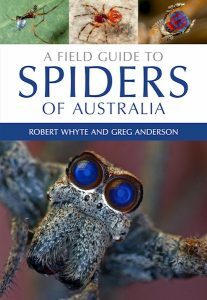 I was very pleased when I heard the first hints that a new guide to them might be on the way, the more so since the author-to-be was my regular mentor in all things arachnological through his site Arachne.org and the Spiders of Australia flickr group. When he asked whether he could use a couple of my photos in it, I was – to use an old-fashioned but somehow appropriate word – chuffed. And now it’s out! I’m too close to it to write a formal review but can’t resist sharing my enthusiasm (which is exactly what I’m doing in most of my blog posts, now I come to think about it). Like those other field guides, this book is intended for interested lay readers. There’s a substantial introductory section including shortcuts to identification, and technical language has been avoided as far as possible. The core of the book is “Spider Families A to Z”, divided into Mygalomorphs (tarantulas and the like), Araneomorphs (everything else) and “Little-known spider families” – araneomorphs so obscure, in some cases, that the whole family is known only from a couple of specimens. Each family is introduced in a short essay, and species are shown in excellent photos in their natural settings; the captions give additional information. Interpolated essays discuss odd topics as they come up – kleptoparasites, ant-mimics, citizen science, etc. It’s all very browsable, and mere familiarity with the images will help most of us considerably when we return to the book with a specific identification question. Incidentally, some of the “unofficial” species, known but not yet scientifically described, are included in the book. While not complete, therefore, the Field Guide will nearly always get the reader close to an identification – “perhaps Nicodamus peregrinus,” for example. Those who prefer e-books are offered that option (click on the CSIRO link above). They do have advantages of searchability and portability (you can squeeze a whole shelf of books into a gadget not much bigger or heavier than this one book) but I think we’re inclined to use them somewhat differently; to each his own. 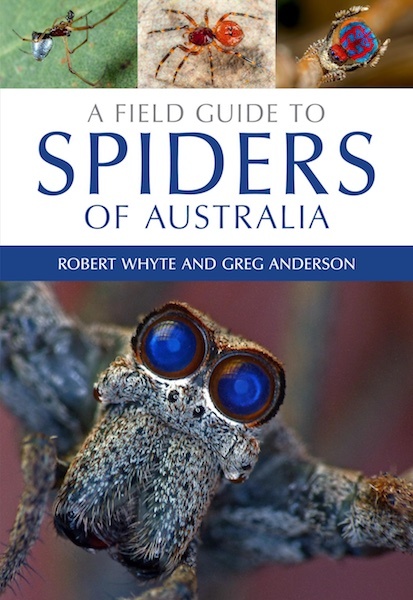 In either format, this is an essential guide for anyone who wants to know more about our spiders. This has nothing much to do with the Field Guide but posting it here seemed like a good way to ensure spider-friendly people saw it. Please do not click on the link unless you like pictures of truly enormous spiders: it shows the fangs of a Goliath Tarantula in all their intimidating glory. Ready? Click here.